When you login with built-in administrator and open Microsoft Edge(new browser that replaces internet explorer), you may notice below error message. Microsoft Edge can’t be opened using Built-in Administrator account. Sign in different account and try again. The resolution to this problem is disabling this security setting from local policies. Follow the below steps to resolve it. 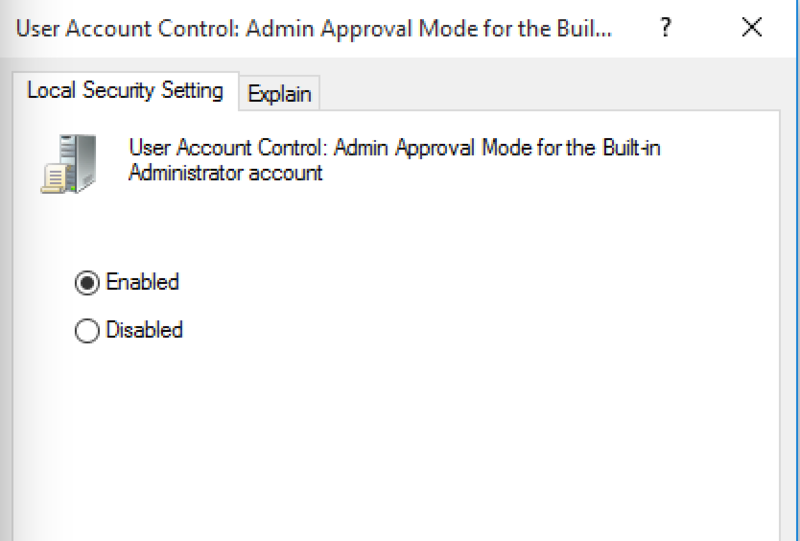 Open User Access Control : Admin Approval Mode for the Built-in Administrator account policy and enable it. After restart, login with administrator account again and you can start browsing using Microsoft Edge. This solution is problematic at the very first step. I can’t open gpmcedit.msc using built-in administrator account. What is the error you are getting Kyle? I have done this and now it will pop up and then shut down. I still get the message saying it can’t be opened. We only have one login and that is the admin account. I really need to fix this. This solution is quite tricky, because enabling this option we’re making our built-in (root) admin like normal-admins if we would have made them from Users-Add new account-type administrator. I’ve noted no difference between them. How did I find that out? So, I wanted to edit my ‘hosts’ file in system32-drivers-etc. Having this tip (from the article) disabled, I’ve met no problems. Enabling it, windows said that I haven’t got enough permissions to make it. This message also is shown, when I log on as a ‘normal’ administrator. And also, typing win+r, you’ve got no message below saying that “This task will be created using admin privileges”. Would be glad if anybody could solve this problem. Hi, The purpose of post is for allowing built-in admin perform actions like normal admin.It is not clear if you notice any problems with that. Consider a situation where you have only built-in admin account in the box, you want to change some settings which are being blocked by admin protection mode. How will you proceed? Create a new admin user and make changes part of that account? You can do that but the problem is additional work. This just saves that one step. It did not work as you measure. Hi Rockydeng, what is the problem you faced while enabling this?